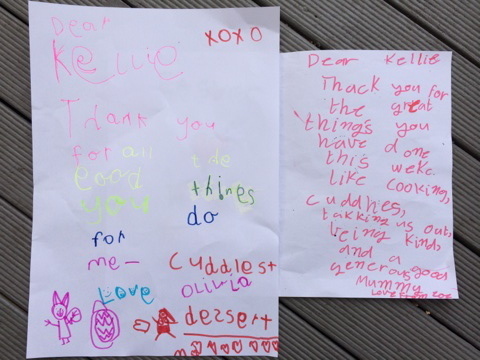 I know you have heard of Mother's Day, but have you heard of a Gratitude Letter? Better yet, have you ever given one? It is an unexpectedly uplifting experience. I gave one to an ex boss of mine, and she kept it for years. It's nice to be appreciated. And it feels pretty good doing the appreciating too! So you can probably see where this is heading. Mother's Day is coming up -- what a perfect time to ask your children to tell their mother, in their own words, what they love and appreciate about her. How about they write it in a letter she can keep? You can help them if they are too young to write. My husband did. Here comes the best part: Then you have them read it aloud to her -- with your help if they need it, and really make her day. Everyone in the family has all the positive emotions buzzing through their bodies and brains (read on to see why that is SUCH a good thing for everybody). Then we will make it even better. If you can record the reading and the reaction, take a photo of them hugging at the end (and a photo of the letter), pretty quickly you have the ingredients of a heartwarming video that we will post on our YouTube channel with others -- and you can all watch it and send it to your family and friends. It nourishes a fundamentally-affirming life stance -- it is saying YES to life. And it helps us cope with stress, both in everyday life and trauma, recover more quickly from illness and enjoy more robust health. AND it can be cultivated -- in an enjoyable way. By writing a gratitude letter for example! So go on, make Mum's day and make the world a kinder place, one Mom at a time.